Hubbub Bicycles | Atelier for proper bikes, because a proper bicycle is simple fun… comfortable, beautiful, useful, and dependable. Atelier for proper bikes, because a proper bicycle is simple fun… comfortable, beautiful, useful, and dependable. 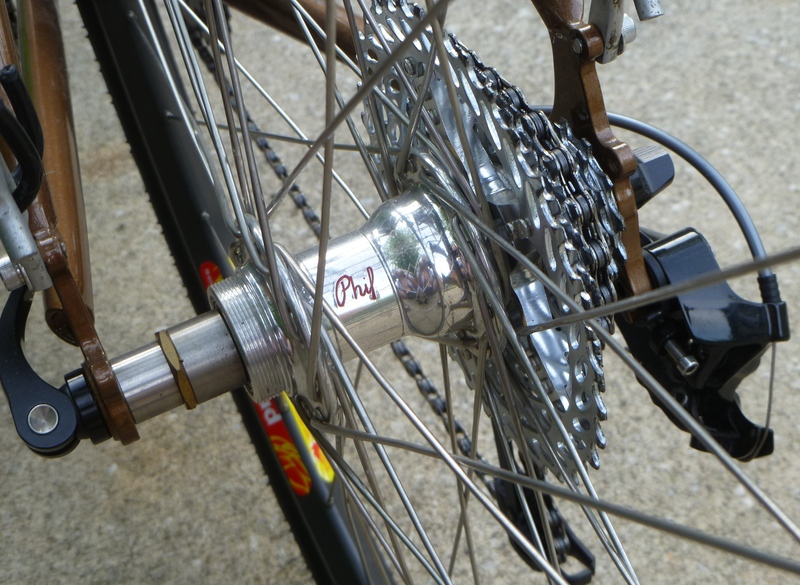 As described in this weekend’s episode of Diane’s Outspoken Cyclist Radio podcast, in 1999 we were inspired to determine a way to manage a wide-range Shimano drive-train using Campagnolo ErgoPower shift controls. I wrote a web article in 2000 about how to do it without the use of adaptation devices (shortly before the release of Jtek) and then again in 2003 posted a revised edition. Since then SRAM has entered the scene with alternatives for wide-range road gearing, and Shimano has not only attempted to meet that challenge, but they’ve also dramatically improved their shift-control ergonomics, function, and reliability. Although one of my favorite personal bikes still has this original “ShimErgo” setup, and I don’t intend to change it, with the modern gearing options available and working so well I’ve lost my reasons for (and therefore interest in) exploring ways to control Japanese derailleurs using Italian shifters, at least on new builds, for now anyway. For years after posting the original article I received countless questions about how to combine components of different makes. In nearly every case my answer was, “I don’t know… I haven’t tried it.” When a client presents a problem, I try to solve it, but I’m afraid that doesn’t make me an expert in how to combine every shift-control with every other [claimed] incompatible derailleur mechanism. A few years ago we made major changes in direction with our retail shop Hubbub Bicycles, and my outdated articles were pulled without second thought. I still have them though, and recently discovered many folks continue to apply the simple re-routing technique sometimes. In conjunction with Diane’s interview of our pal Mike Varley, proprietor of Black Mountain Cycles, in which this is mentioned, we thought it might be a good kick-in-the-pants for me to post a fresh edition of the article, even if just for sentimentality. If you intend to torment yourself reading it, please do keep in mind the time period and then-available parts, for context. I think maybe I was smarter back then. In any case, here’s a modernized version of the original how-to, and at the end of this podcast I bumble through an explanation of how we came to discover it. I’d recommend enjoying the whole show though. This entry was posted in Uncategorized on May 13, 2017 by brian. Whew! Yeah… it’s been a while. I write this from a train, because it’s one of the few chances I’ve had to settle down enough to focus on it. I figure however it’s about time to relay an experience I had building up a Calfee Luna last season, an issue actually, and the solution to which I arrived. Some time ago I’d heard of difficulties getting Shimano’s 11-speed Ultegra front derailleur to work optimally, and didn’t quite understand what the problem was. It’s just another derailleur, right? Now that I’ve seen it myself, and not heard of a solution, I find it hard to believe others aren’t occasionally encountering this, so here’s a description of what worked for me. It’s no secret among those who know me that I have minimal enthusiasm for these component manufacturers each time they release another group with more gears. I was fine with 5 and 6-speed, and really liked 7-speed. When they released 8-speed that would have been okay, but 7 was enough, and the 8-speed system never seemed to perform well. I’d rather have 7 that work great. 9-speed was fabulous, in my opinion. It shifted well, was serviceable, highly compatible with off-road components – allowing us to develop creative gearing solutions for tandems and touring bikes. It was also the first time we saw truly wide ranges available for folks who needed them with minimal compromise to shifting performance. Then they jumped to 10-speed… yawn. The groups got noticeably lighter and stiffer, but the tenth gear didn’t matter much and performance became finicky and less reliable again, and the superior features did not require an additional cog. Eleven speed appears to be a whole different story. Historically I wouldn’t have cared about that 11th gear, if you can’t tell by now, but properly installed this stuff works brilliantly. The range for a double is wider than the old triples, and the ease, crispness, and response of shifting feel is phenomenal. Even any lack of cross-compatibility (road vs. mountain) is beginning to not matter any longer. The price for this however, aside from monetary cost, is the precision required to get it set up working perfectly. This brings us to the point of today’s post. After so many years of building bikes using frames from Calfee Design, I had somehow forgotten Calfee build their frames using asymmetric bottom bracket shells. I’ve never seen a mis-aligned Calfee frame, but you can clearly see in the photo that neither the seat-tube nor the down-tube intersect the shell at its center. This is intentional, and perfectly okay as long as the bottom bracket, the wheels, the steering axis, and the saddle’s center are all within the same plane. That is to say the frame must be in alignment, and it is, even though the shell is offset to starboard. If you understand kinematics you will recognize that the attachment lever and parallelogram on a derailleur have different relative movements throughout their stroke. Although the parallelogram ensures the cage’s stability and vertical orientation, it does move through an arc. Since it’s activated by a cable pulling on a lever, and this cable pulls in an effectively linear fashion (as opposed to unwrapping about a barrel), a given amount of cable pulled at the lever will result in different resulting movement at the cage according to location within its range of travel. Manufacturers account for this by matching the radius of the control’s cable wrapping mechanism to the dimensions of the contact points and parallelogram in the derailleur. SRAM in particular, I believe, takes pride in their 1:1 pull-to-response ratio. That’s cool… but one of the sweetest things about Shimano’s latest 11-speed mechanical system is the fast, smooth, and effortless action of the front mechanism. This is acheived using a much longer lever than in the past, even requiring variable cable anchoring. As brilliantly as it works, properly adjusted, it is unfortunately rather unforgiving to even minor variations in spacing from the seat-tube. 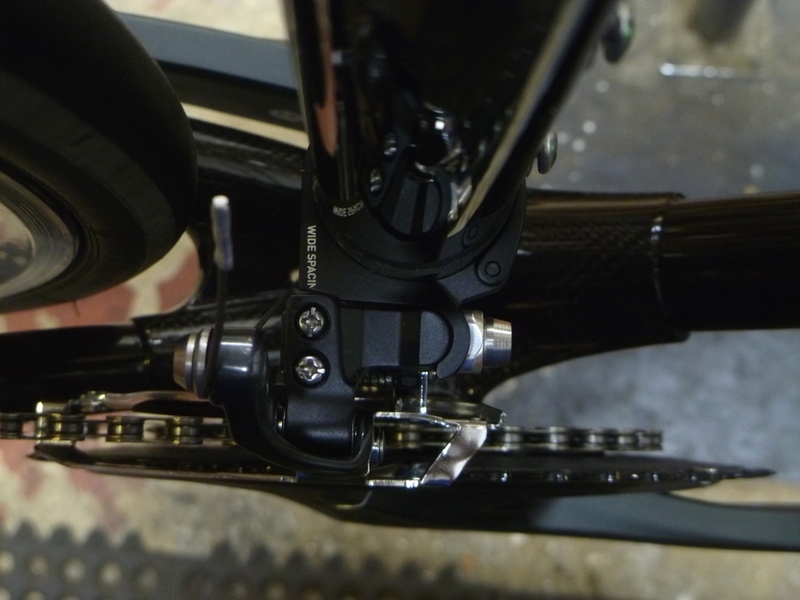 I found on several initial builds that the setup required a bit extra care in getting the adjustment perfect, and there’s the new trim “feature” which disallows the derailleur from slamming all the way to it’s lowest point upon the down-shift, but the results were in general excellent. Trying to finish the build on this Calfee however, no matter what I tried for yaw alignment, cable tension, and limit screw settings, it was simply impossible to get full swing out of the derailleur and it would rub the chain on the big ring. 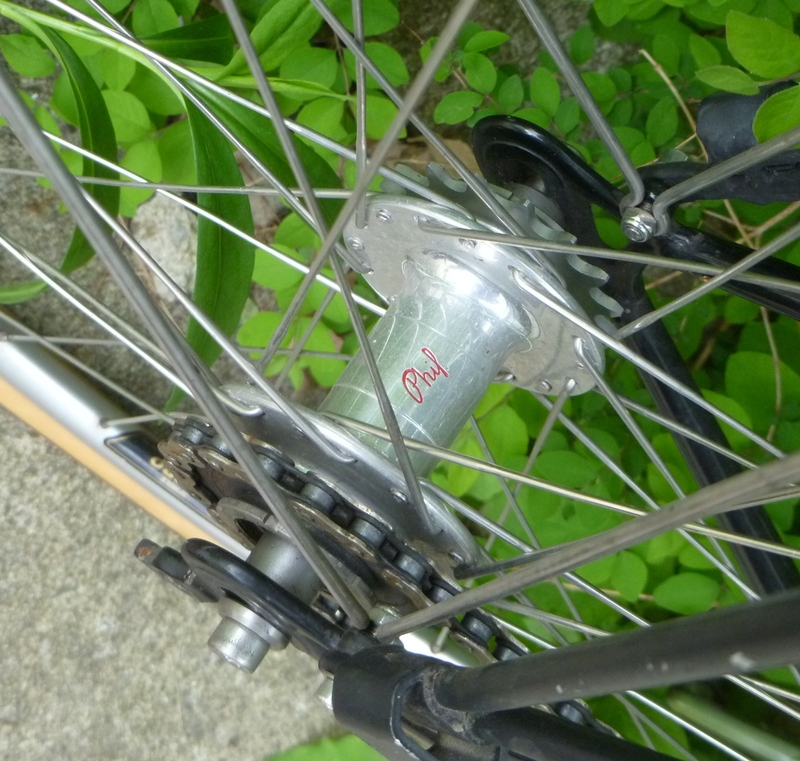 By the time the cage had reached the big ring position, any further cable pull would result in the derailleur moving up more than out, because its mounting point (the seat-tube) was too far away. What do do? One idea I had was an eccentric clamp spacer, permitting fine adjustment. I still may work on further developing that for similar applications, but I then remembered SRAM makes a Wide Spacing version of their clamp adapter. 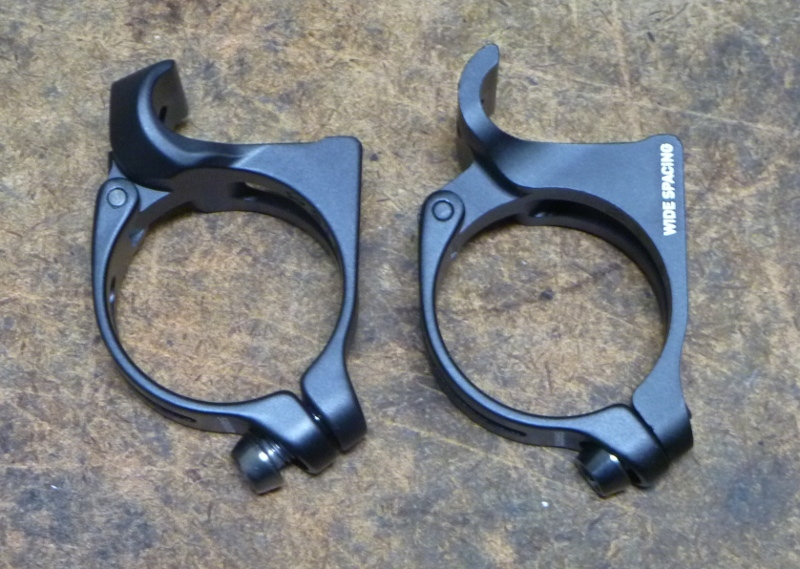 Their clamps are very light and well made, so far seem reliable, and integrate perfectly with SRAM’s own chain-watcher device – a rather clever design. 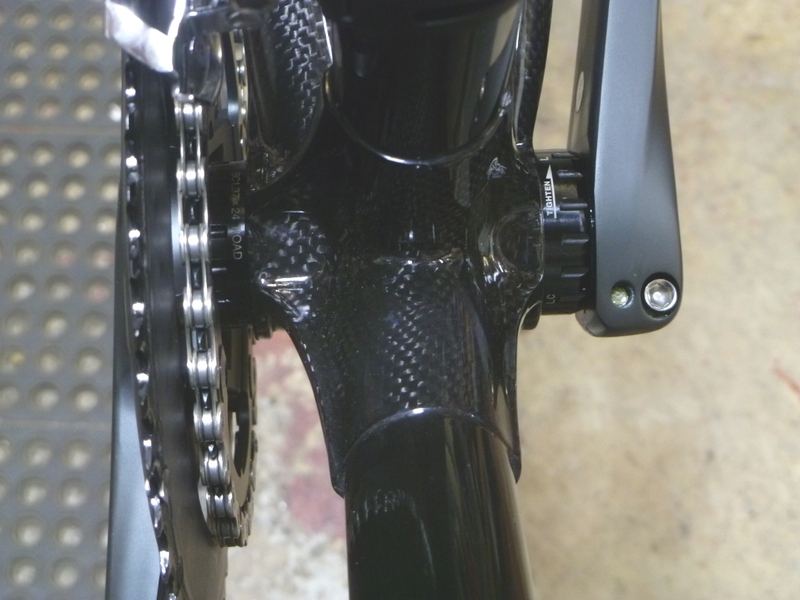 They are however made to support exactly the profile of SRAM’s own derailleur body, preventing flex and yaw movement. Shimano’s derailleurs don’t rest well against the little tab protruding out from the clamp, so I filed it down to fit the contour, and installed. I must admit I do not remember what the initial clamp adapter was that I tried. It was in all likelihood a Shimano, which I have otherwise found to work well. I have installed every edition of Shimano’s Di2 front changers to Calfee frames, more times than I remember. We never experienced this issue, so it appears to only apply in the case of 6800 mechanical. That said, I am curious to explore whether front shifting performance might be further improved this way. The FD-6800 uses a yaw-preventing set screw just like the Di2 mechanisms. If the clamp is filed to fit well, this set screw becomes unnecessary. This entry was posted in technical and tagged 6800, adjustment, clamp, front derailleur, Shimano, Ultegra on June 19, 2015 by brian. We participate in a confidential e-list discussion forum of bike dealers, in which we all abide by understandably strict rules about repeating or relaying the opinions or specific writings of other retailers. It only makes sense though that careful generalizations are permitted, at least to provide context for a topic discussed elsewhere. Someone wondered whether Phil Wood was selling directly to consumers, implying a question of whether this was acceptable in terms of business practices favoring the Independent Bicycle Dealer (IBD). My response was that yes, Phil Wood & Co. has always been willing to work directly with their end-user and bypass the retailer. They have however maintained a strict policy of charging at least what their retailers will likely charge, so there’s no real price competition. Another factor I did not mention, but others indicated, was one significant advantage for retailers in having Phil Wood do this. They have a long history of producing high quality intricate parts, and servicing so many years’ of those items would require us tying up capital in stock of hundreds of these pieces, and maintaining inventory of them, just to claim we can replace a pawl and spring in a 1979 hub once every 6 years. I’m happy to do it too, but I’ll gladly permit Phil Wood to take that job, thank you. They earned it. Within my reply was contained a comment, “We’re not entitled to free profits. We earn them by providing a service, to both the supplier and the customer, and it’s our job to convince the customer we’re worth it.” This of course was not referring only to flat tires, bent wheels, and spring tune-ups, but really encompassing everything cyclists might expect from their bike shops; on the showroom floor too, including earning a fair share to help procure, install, ride, and possibly service a conscientiously selected Phil Wood product. Another thread brought up our annual international trade shows, and whether we as retailers will remain as relevant as we have in the past, to our suppliers, to our customers, and even to the show itself. Do our suppliers [and customers] need us, or are we just another “cog in the distribution chain,” eventually found obsolete? Similarly some customers feel we are critical entities in their lives, sources of valued services, advice, and the best products and end support; hard to imagine living without. They’ll occasionally pay a slightly higher price than they know can be found elsewhere because they also believe it supports our continued existence, from which they draw tremendous value they don’t always fund directly. Unfortunately this often paints the IBD portion of our industry as charity. Others think of us as fun places to visit, but only worthy of their hard-earned money when the value is clear and obvious in the moment. Finally, a growing number seem to view the IBD as almost completely unnecessary service centers for tube changes and wheel truing, not a sustainable business model and, similar to the final example of suppliers above, just another place to spend more money than should be necessary. Neither the manufacturers, distributors, nor consumers owe us anything not earned, not even an opinion on how to perpetually justify our existence into their futures, let alone our value or place in the industry’s chain of distribution. By itself it doesn’t matter that we have 40 years of business behind us. The experience itself matters, but then only if we can apply it for someone else’s benefit. It doesn’t matter that we pay for all our business licenses and government mandated fees, collect sales tax (without compensation), are available for service and support 70+hours per week, answer hard questions for free, promote or support community and charity events, anonymously bolster or refer business to competitors, and strive after-hours to push the boundaries of our training and expertise abreast of what is provided to our customers through magazines, group ride wisdom, and social media, while still fairly paying employees, supporting our families, and paying the mortgage. It doesn’t matter that we provide a conveniently dry, lit, and heated space to experience the products and perform the services. None of that matters and, for the most part, little of it should… it’s the harsh truth, but it’s the real world. What matters is the value we can relay to a customer when she’s standing before us with a checkbook. She needs to leave our shops knowing she got a great deal, not because she paid a cheap price, or even because she subsidized our existence for when she really needs us, the next time. She needs to know she got a great deal because we provided her with a level of service equal to or greater than what she paid, not just in the moment, but relative to her overall cycling experience. Yes, it really is that basic. Sometimes we may provide a high level of service and under-charge, and she still feels ripped off. Other times we do something simple and charge too little, and she may feel exceedingly privileged. An enormously overlooked part of our jobs is to accurately convey the true value of what we produce. And yes, we need to produce something, not just present it. And we need to latch the shop door each night knowing we were fairly compensated for those services, whether repairing a flat tire, addressing a warranty issue, or developing and executing an ingenious solution to a complex problem. Likewise manufacturers and suppliers are not obligated to attach assumed values to the services we provide. They’ll see it when it shows up (or doesn’t) in their own bottom lines. As IBDs, we’re only cogs in the machine if we’ve chosen and elected to stubbornly hold that position. Cogs are easily replaced, and machines become more elegantly designed (cog-less) by nature of our free market. It’s up to us to either convince the customer and our suppliers that our cog-in-the-machine model remains ideal (through example), make ourselves an indispensably superior cog, or participate heavily in the on-going re-design of that fancy new replacement, potentially cog-less distribution model so that it still somehow includes us. Maybe it’s high time we sought the opinions of our customers. What do you think? This entry was posted in business and tagged bicycle industry, bike business, IBD, service on May 26, 2014 by brian. When I first heard of this book, probably around the time it was published, I just… had to have it. At the time it was challenging just to figure out how to get one. Entirely self published and distributed from Spain, this treatise is arguably the most definitive writing on the hows and whys of handling in single-track vehicles. As should be obvious from the title, it’s not about bicycles, but you don’t need a deep imagination to recognize how much can be learned about bicycle geometry from studying motorcycle dynamics. Bicycles of course do appear in the text a couple times, and are used to experiment and clarify some of the physics principles governing steering and lean-angle. We must however bear in mind an important point about the differences between motorcycles and bicycles with regard to analyzing their handling characteristics. On both machines the rider is a critical element to be considered as part of the machine. The motorcyclist however is a relatively small percentage of the machine’s (bike and rider) overall weight, often less than 35%, while of course a bicyclist comprises the vast majority of the machine’s weight, rarely less than 80% for adults. Add to that the sheer differences in power, and these have profound effects on the vehicles’ centers-of-gravity, and how the rider manages the CoG. Another distinction (of many) is wheel and tire size, weight, casing design, pressures, and forces. Although mostly the same effects exist in the tires and wheels of both machines, the magnitudes of those forces are so vastly different that we must be very careful with any assumptions we make about their similarities. In numerous instances a line of understanding, in terms of handling design, cannot be directly applied between the two vehicle types. Nevertheless this book provides tremendous insight, at the very least, into the sorts of things a serious bicycle designer should be considering and trying to understand. Motorcycle Handling and Chassis Design is one of my favorite books on my shelf, but I’d only recommend it to others who are also interested in the rather dry details of handling geometry in bikes. The clarity in the writing, the comprehensive analyses, hundreds of photos, diagrams, and graphs, and the well thought out explanations are astounding. Sure it reads a bit like a text book, but anyone would be hard-pressed to explore and report on such a technical topic more effectively. The author‘s brilliant efforts to go light on mathematics, but instead illustrate with practical theory and experience, must not go unrecognized. I understand a new edition was released in 2006. I have not seen a Spanish version, but my paperback copy is entirely English, and written so well it’s difficult to imagine it having been translated. The latest edition claims to be even better than mine. Hmmm… What’s a book junkie to do? 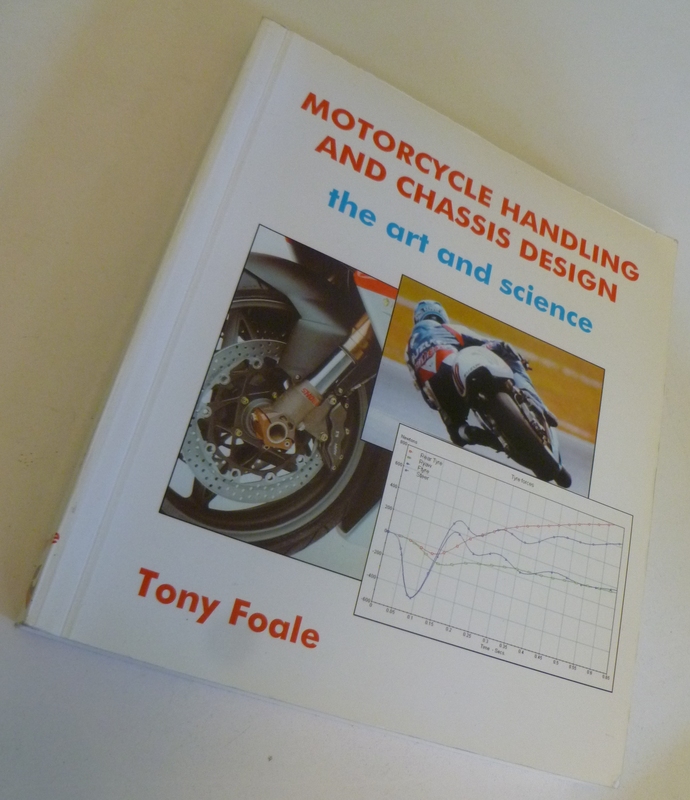 This entry was posted in bookshelf, technical and tagged book, design, handling, motorcycle, Tony Foale on May 18, 2014 by brian. This isn’t true for everyone but, for many of us, fitting a tandem is a bit different from how we like to ride our singles. Generally the stoker wants to be a little more upright, because she (or he) can be, since she’s tucked out of the wind anyway, and usually wants a better view of passing scenery. Additionally, as long as you’re confident the rear seat-tube will be a good length for her saddle height, knowing exact details of her final fit parameters is rarely critical ahead of time. The rear of the bike is so highly adjustable that you should need little more than confidence that her parameters can be met once you have the actual bike in front of you. Note too that (for most stokers) she never stands flat-footed over the bike, so top-tube clearance is usually a non-issue. For the captain, on the other hand, it’s a good idea to know most of the details about how his fit will be accomplished. Although his single bike’s dimensions can be transferred, and that’s a great start, beware here too his fit requirements might be slightly different, to accommodate the longer bike and rear-load, as well as possible differences in ride approaches, such as aggressive sport riding on singles versus more relaxed touring on the tandem. Everyone’s preferences and cycling goals of course are different, but these are the things we consider. Finally, if you haven’t yet much tandeming experience, beware you will both likely spend far less time out of the saddles than you do on your singles, at least initially. When only on our single bikes we tend to thoughtlessly make adjustments, stand, and accommodate comfort needs automatically. Very little happens on a tandem without intention, forethought, and verbal communication, especially at the beginning, so we tend to just sit and pedal until issues become unbearable. Remember too that the captain must be able to very confidently stand over and stabilize the bike, sometimes on un-even terrain, with the stoker mounted. This doesn’t affect how the bike should fit him while pedaling, but it might be a factor in determining its basic size. We always used to do at least a full fitting for the captain, and sometimes for the stoker. We would certainly confirm basic dimensions for the stoker, but occasionally customers already knew what they wanted, which is great too. We would however insist on finalizing fit details once the bike is built and ready to ride. This entry was posted in fitting, technical and tagged fitting, tandem on May 13, 2014 by brian. Bantam Books. New York. 2012. I’ve lost count of the number of times The Secret Race was recommended to me, after I had read it. Co-authored by Daniel Coyle, this mostly first person history of Tyler Hamilton’s experiences with performance enhancing drugs in the peleton is quite possibly the most forthcoming account of drug use in professional cycling we’ve yet seen. It’s not always easy to stomach, and of course there’s no way to know just how truthful or complete Tyler’s side of this story is, but most fellow skeptics seem to agree, the exhaustive details make a lot of sense, and are too deep and interconnected not to believe. By Lance Armstrong’s third TdF win, I was one who believed most successful professional bicycle racers were at least occasionally guilty of drug use, particularly Mr. Armstrong. That’s not meant to be an I told you so, as for the most part I don’t care, but it may help to illustrate just why I’ve been rather bored with the controversies over the years. I don’t like it, and certainly never approved, but it hasn’t interested me much either. This book has, so far, been the only exception. Once I started reading it, I was as hooked into the story as anyone. The excellent writing certainly doesn’t hurt. Speaking of the writing, my partner Diane interviewed the author, Dan Coyle, on her Outspoken Cyclist Radio show, back on October 6 of 2012. He happens to live, at least part of the year, here in northeast Ohio. 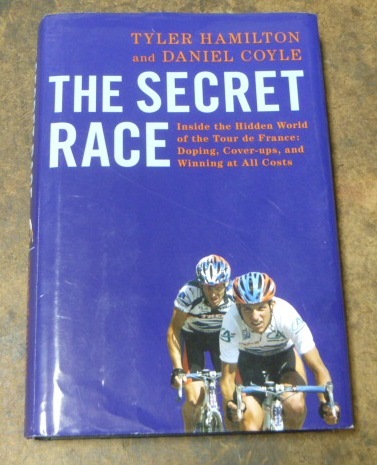 This entry was posted in bookshelf and tagged bicycle racing, book, Daniel Coyle, performance enhancing drug use, Tyler Hamilton on May 11, 2014 by brian. 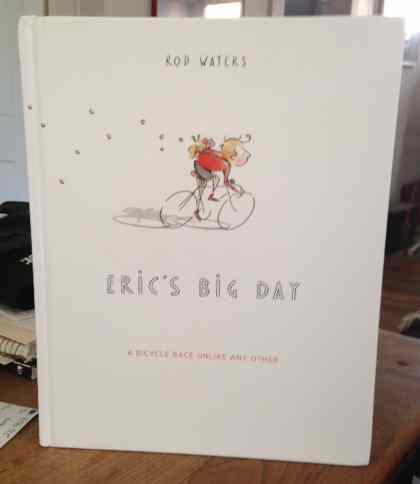 Eric‘s Big Day, is a whimsical children’s book that takes young Eric on a journey to visit his friend Emily in the next town to share a picnic. Eric packs his knapsack with a multitude of items including a large balloon and some sticky candy, all of which it turns out will come in handy as Eric meets bicycle racers on the road along the way who need his help to cross the finish line. The book is beautifully illustrated in a pen and ink with color wash style that is reminiscent of a New Yorker magazine cover or a French panel of sketches. Although the story is meant for children 4-8, some of Eric’s clever fixes for problems along the way will remind many of us of the things we have done to keep our bikes on the road when we had nothing but a dollar bill to stuff into a torn tire. This entry was posted in bookshelf and tagged book, children on May 3, 2014 by brian.